Steven Pinker’s writing is intriguing. Just about everything he says is half right and half wrong. 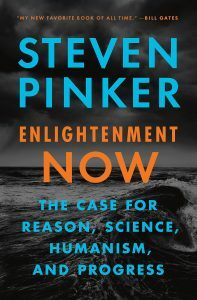 In this and his previous books, all of them highly intelligent and well-informed, Pinker makes the case for an “enlightened,” optimistic, and secular view of the world. The author believes that we are lucky to be living at a moment in history when, due to the global spread of science and technology, such difficulties as war, disease, poverty, and ignorance are rapidly abating. All that remains is to defeat those traditional evils of enlightenment: greed, violence, religious fanaticism, and political populism. Pinker begins by making the case that the world is getting better. He supplies convincing data to show that, by almost any measure, material conditions began improving at the time of the Industrial Revolution and have advanced exponentially ever since. There is no doubt that a larger percentage of the world’s population is entering the middle class, and that prosperity is certainly a good thing. As Pinker points out, the material advantages that we in the West take for granted—clean water, electricity, literacy, and modern healthcare, for instance—are transformational in societies that have never had access to them. For much of the world’s population, future advancements lie ahead. The world in 2100 will not resemble that of today. Still, one should not suppose, as Pinker appears to do, that material advancement itself plays a decisive role in human happiness. This mistaken notion underlies much of Pinker’s argument, and it leads either to indifference or outright hostility in regard to the nonmaterial determinants of human well-being. Once one has satisfied one’s basic material needs, further gains are increasingly less important. What is missing in Pinker’s analysis is an understanding of the primary importance of what T. S. Eliot termed the “permanent things.” Between 1900 and 2000, the American standard of living improved by a factor of ten: the prospect of its improving another tenfold over the course of the present century is not an entirely happy one, despite Pinker’s promise of a near total end to war, disease, and poverty. Were Pinker’s argument to be strictly about the advancement of living standards, one could accept Enlightenment Now as just another benign work of futurology, but there is a darker side to the book: it manifests not just a lack of attention to mankind’s need for spiritual order but an outright dismissal of and, at times, hostility toward such. Indeed, Pinker employs a Trojan Horse strategy of appearing to argue “rationally” in support of universally agreed-upon goals—longer life expectancies, higher living standards, and the rest—while actually advancing a veiled argument for familiar progressive causes such as income equality and climate control. Enlightenment Now is far from being an ideologically neutral, “scientific” treatise on human betterment: it is a clever contrivance that manages to confirm nearly all the ideologically approved positions of the left even while asserting its own supposed independent point of view. Granted that Pinker’s views are somewhat more tempered than those of hardline leftists of the past—he criticizes the left’s continuing enthusiasm for communism, for example, by describing actual outcomes—yet if Enlightenment Now were truly dispassionate, would it not at some point explore in an open-minded way orthodox Christianity, conservative politics, and the right to life? A truly open-minded and informed analysis would acknowledge the value—even that measured in material terms—of church participation: longer life expectancies, greater productivity, better health, and lower levels of depression, advantages that Pinker insists “have nothing to do with beliefs in God, creation, heaven, or hell.” The author cites research purporting to show that the same advantages of religious activity can be derived from participation in such social activities as bowling, but fails to consider the non-material “advantages” of religious faith, such as the peace and sense of purpose derived from sincere faith in the existence of a loving God. For believers, the prospect of a planet on which religious practice has been lost (or effectively driven from the public sphere, as is the trend in the United States) is horrific. It also appears that Professor Pinker is one of the “Science Is Settled” set—those individuals on the left who, finding that their opinions carry the field neither at the ballot box nor in terms of firm proof, are given to declaring “the Science Is Settled,” and then asserting that those who argue otherwise are either fools or heretics worthy of prosecution. Apparently, if enough voices are organized to declare at once that the “Science Is Settled,” it is assumed that the science is indeed settled. This approach, which in rhetoric is referred to as the informal fallacy of “mob appeal,” is patently improper. The fact that many on the left have turned to it is not a good sign since it means they have abandoned logic and reason and have turned to a form of rhetoric identified with extremism. A large number of “experts,” whether teaching at Harvard or drinking in a Munich beerhall, subscribing to one side of an issue does not settle the issue. It is also, of course, a very bad sign for our democracy that some on the left appear to believe that once the science is settled, the democratic majority have no right to govern as they wish—or even voice an opinion. Increasingly, the left’s views are imposed on the public by way of academic consensus, agency findings, or governance from the bench. The “science” of global warming is a good example. Unintended consequences shadow much of what the author says about an enlightened future. Pinker asserts that “the next step [after generous redistribution schemes] in the historic trend toward greater social spending may be a universal basic income.” Legitimate arguments can be made in favor of such an arrangement, as they were, of course, by Milton Friedman. Eliminating the high cost of the welfare state would increase funds distributed directly to needy citizens, yet a universal basic income would not necessarily result in improved outcomes. An eighteen-year-old receiving a thousand dollars per month would probably not spend his windfall on cultural pursuits or education. Worse yet, many families now receiving SNAP benefits would find themselves without food after the first of the month, by which time they could have squandered their universal income allotment on less healthy alternatives, including perhaps drugs or alcohol. An increase in absolute income does not translate into a greater level of happiness unless it is accompanied by personal responsibility, and it is a fantasy of the left to suppose that the “undeserving” poor, if just given a chance, will quickly reform. Clearly, Pinker’s work is in crucial aspects disturbing, but it is important to recognize that a sizable percentage of readers do not apparently find it so. The author is, after all, a distinguished professor of psychology at Harvard and a member of the National Academy of Sciences, and his books have won many prizes and gained a wide readership. Where Pinker excels is in amassing a great deal of data aimed at creating the appearance that science supports humanist goals. The dark side of Pinker’s writing is that it enshrines one set of goals and then argues forcefully in favor of either “educating” the public or imposing those outcomes. That activist prescription is all too familiar in the history of progressivism (as with Obama policies influenced by advisor Cass Sunstein, co-author of Nudge: Improving Decisions about Health, Wealth, and Happiness), and it has always mitigated against human liberty. At its worst, it has devolved, as it ultimately must for true believers, into authoritarianism. It is difficult to dismiss Pinker’s writing since it displays extraordinary rhetorical skill, but the word that comes to mind so often in reading his work is “superficial.” Enlightenment Now is the product of high intelligence and exceptional diligence, but it seems tone deaf to the enduring facts of human nature and the human condition, and, I would add, to the growing realization among populations everywhere that progressivism has not resulted in greater human happiness but rather in enslavement. Indeed, having read Enlightenment Now and other works by Pinker, I am left with a chilling fear of what progressivism might do were its adherents to gain complete control. The world that Enlightenment Now envisages, that same world imagined in the past by Edward Bellamy, H. G. Wells, Benito Mussolini, Franklin and Eleanor Roosevelt, LBJ, and Obama, is one of state control, intellectual repression, and regimentation. It is not the route to happiness but to a death-in-life unlike anything the world has seen, even in that ancient Babylonian past in which, as the author points out, an hour of candle light (by sesame seed oil) cost 50 hours of human labor. Better to sit in the dark than to live in thrall of those “experts” so highly recommended in Enlightenment Now. Those experts may excel at efficiency, but they ignore the deepest needs of human beings. Enlightenment Now has a good deal to say about the transformational power of universal wi-fi access—an element in the path, as the author sees it, to enlightenment. Would that he had spent as much time considering the need for faith, liberty, and individual responsibility. The author appears to take for granted the fact that the views he espouses are indeed “enlightened.” Were he to consult the Dhammapada, one of the wisest books in the Hindu tradition, he would read: “Let us live happily, without possessions/Let us feed on happiness like the shining gods.” The value of a certain level of material comfort and security is undeniable, but so too is the greater value of the understanding and peace derived from one’s faith and the wisdom of the past.